the half dollar, quarter and dime were increased slightly to simplify their legal weight as measured in grams. 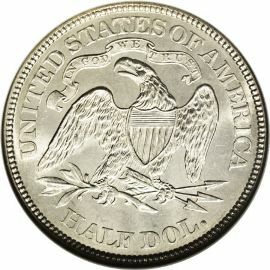 As far as the half dollar goes, its weight increased from 12.44 grams to 12.50 grams. design by Thomas Sully and engraved by Christian Gobrecht. 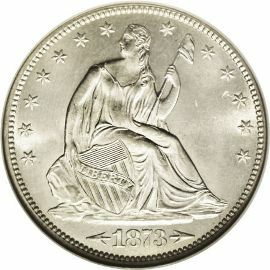 The front of the coin shows a seated figure of Liberty with her right hand resting upon a union shield and her left hand grasping a spear topped by a Liberty cap. Thirteen stars surround her, seven to the left and six to the right. The date is below her with arrows flanking it on either side. first appearing on the Two-cent piece.